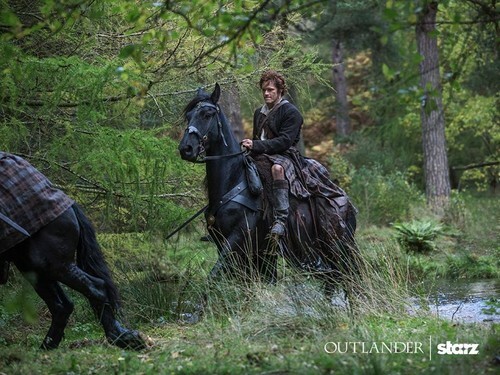 Outlander Season 1 Promotional Picture. . HD Wallpaper and background images in the Outlander 2014 TV Series club tagged: photo outlander season 1 jaime fraser sam heughan. This Outlander 2014 TV Series photo contains lippizan, lipizzan, lippizaner, لاپپیزان, لاپیززان, and لاپپیزانر. There might also be گھوڑے پگڈنڈی, horse trail, گھوڑا پگڈنڈی, گھوڑے wrangler نے, wrangler نے, گھوڑا حجتی, and بکھیڑیا.